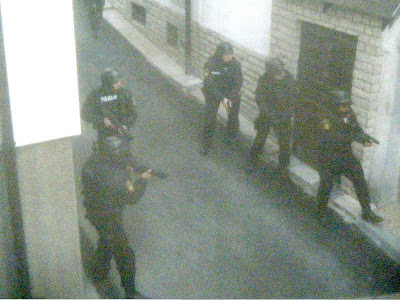 It is not every morning you are shaken from your sleep by the sound of a gun fight; nor that this is immediately followed by the sound of someone running under your bedroom window; nor that you get to take a photograph like this from the comfort of your own living room. But that was last Thursday in Jajce. It was a day that was supposed to have been all about Project Avant-Guarde, a street-art project Rowan has been part of organising for the past couple of months. However a rare armed robbery, or attempted robbery, got in there early in an apparent attempt to steal its thunder. Real thunder and lightening had a go at playing with the best laid plans too. Our PA equipment got caught in a freakishly fast and heavy hail storm. For a moment I thought our mixing desk might have shipped a little too much water to work again, but careful use of kitchen towel, with the aid of gravity and a hair dryer seemed to save the day. Going into details about the Project is best saved until we've edited together video footage from the day. A detailed time-line of our unexpected wake-up call, and other highlights of a crazy day, can be found on Katie's blog. Katie was staying with us to cover the Project as part of her work as journalist for Novi Most. I had also asked her to play oboe with me on an acoustic performance of Handbags and Gladrags, as part of the Project's music and dance presentation. Although I was playing guitar and not piano it was still a lot of fun, at least for me! It was the first time I've ever played with someone playing oboe and very likely the first time most of our audience had heard an oboe played live. I also gave a first live performance of a song I wrote during our time in Mostar. These two combined went a long way to offset the multiple riggings and de-riggings of the PA and extensive cable cleaning that marked my main involvement in the presentation. Hopefully for all the young people involved in the Project it will be a day they remember not for the fatal shooting that occurred in the early hours of the morning but for being a day when they used their creativity and energy to try and make their town a better place. As contrasts go the one between four men trying to take what wasn't theirs by force and a group of young people giving away what they have created for free couldn't be more stark. We all know which the world needs more of.